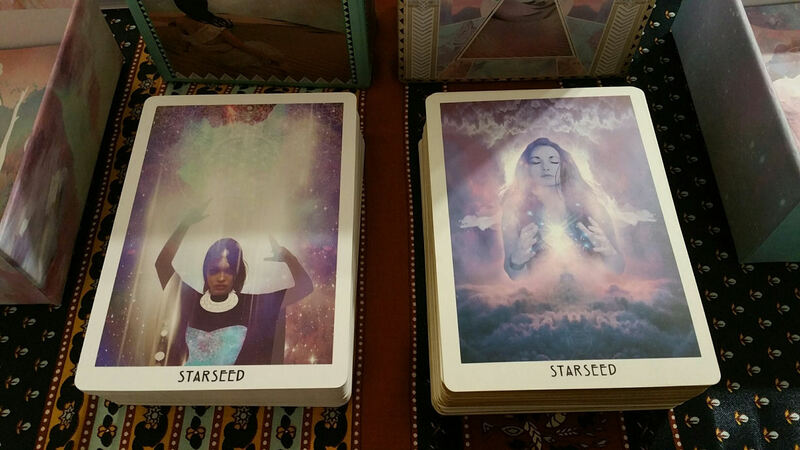 The New Age spiritual movement as it manifests in 2015 and 2016, the years of publication for the Starchild Tarot, embraces the importance of developing personal intuition through cards, like tarot. Decks like the Starchild have introduced a new generation and new class of tarot readers that didn’t exist before. 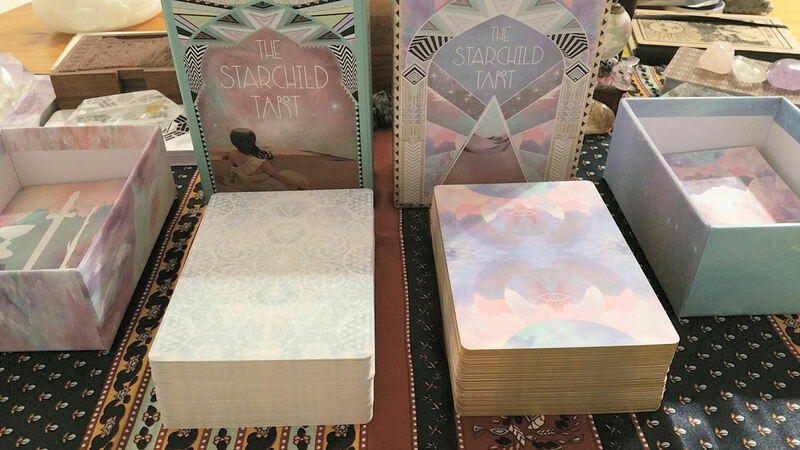 Starchild is one of those decks that makes tarot more accessible to mainstream Millennials. 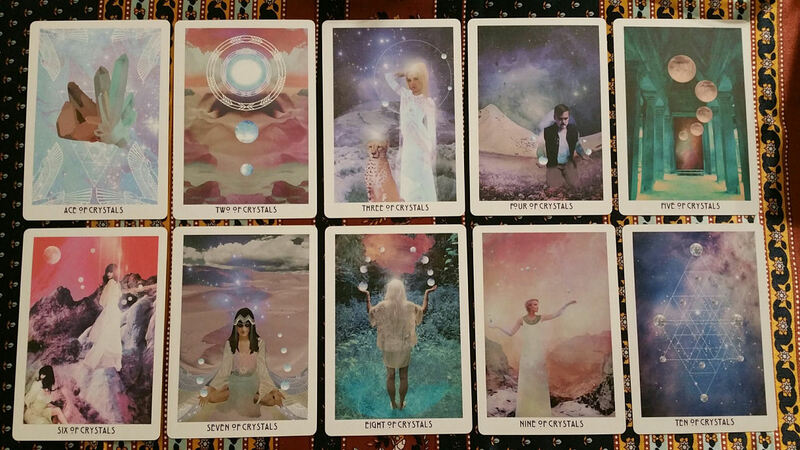 While timeless and other-worldly in its vision, the Starchild Tarot manages to also be very much about the “now,” and the present. 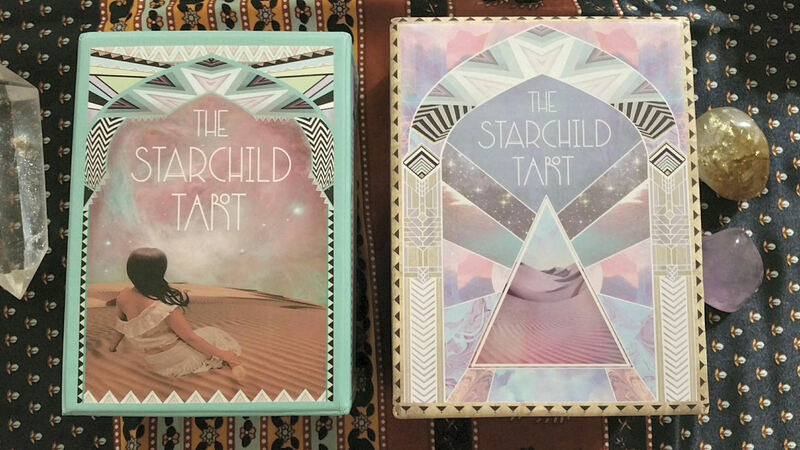 I have both the first edition Starchild Tarot, which I reviewed here back in June of 2015 and now the latest 2016 Starchild Tarot Akashic Edition, which I love even more than the first. As of this posting, the Akashic Edition is sold out, so you’ll have to contact the artist and creator, Danielle Noel directly to see if there is a pre-order option or waitlist for the next edition. 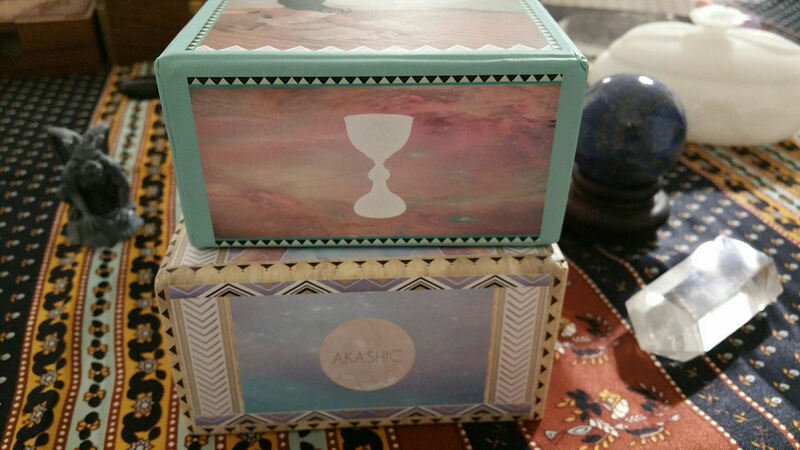 The tarot blogosphere has been gushing over the Akashic Edition and I am a little late to the party (as usual). I figure I’ll use my review time to compare the two editions. On the left is the first edition and on the right the Akashic edition. You can see from the above photograph that the Akashic is just a sidge larger than the original. I’m also loving the new box design. Both boxes are of amazing quality. Noel’s signature style comes through in both. We talked about the card backs from the original edition in my last review, which feels more mathematical than the new card back design. Here, hmm… I’m actually thinking I prefer the original card backs! But it’s an entirely subjective judgment call. The coloring for the Akashic Edition has been muted, giving the design a more “ascended” feel… if a design could be ascended. I do prefer the new cover to the companion guidebook over the original cover. A beautiful new touch to the Akashic Edition is the gilding. I love that the new version is gilded. It’s funny– you don’t realize how blah un-gilded edges are until you do a direct side by side comparison between the old and the new. Then suddenly you’re like, wow, why doesn’t every deck come with gilded edges?! 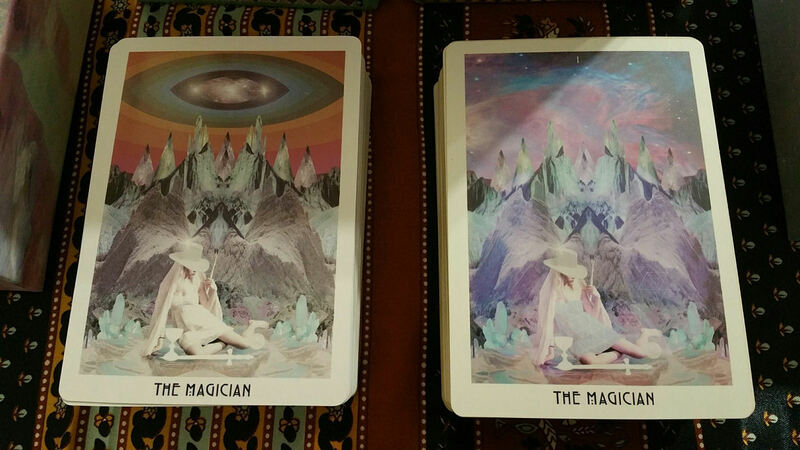 Substantial changes have been made to the card imagery between the original and the Akashic. Above, the left card is the original Starseed or Key 0: Fool card. The right is the new Starseed. I like this change. The old Starseed had a Magician vibe to her. The Magician card seems to have stayed the same, for the most part, with minor tweaks. Again, as you can see here, the coloring for the new deck has been muted, rendered more pastel than the old. There was a more retro vibe to the old version. 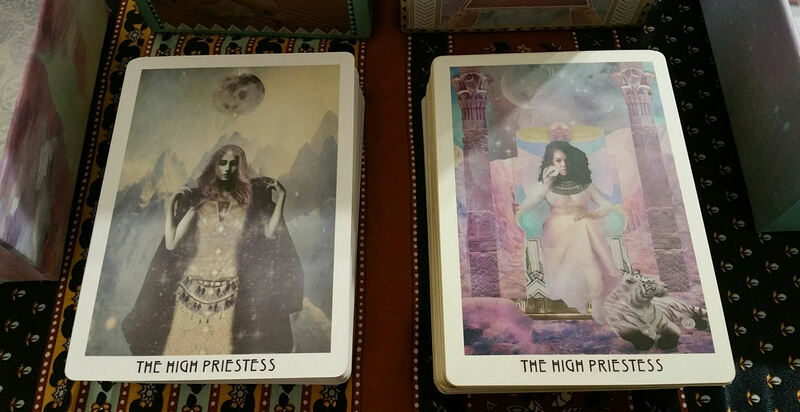 I really like both images for the High Priestess here and can’t decide which is better. I do like the added iconic pillars in the new High Priestess. If you open the old review for the original Starchild and scroll through it side by side with the card images here, you can see all the changes that have been made. The Empress and Emperor have changed. I kind of miss the psychedelic look of The Empress from the original Starchild. 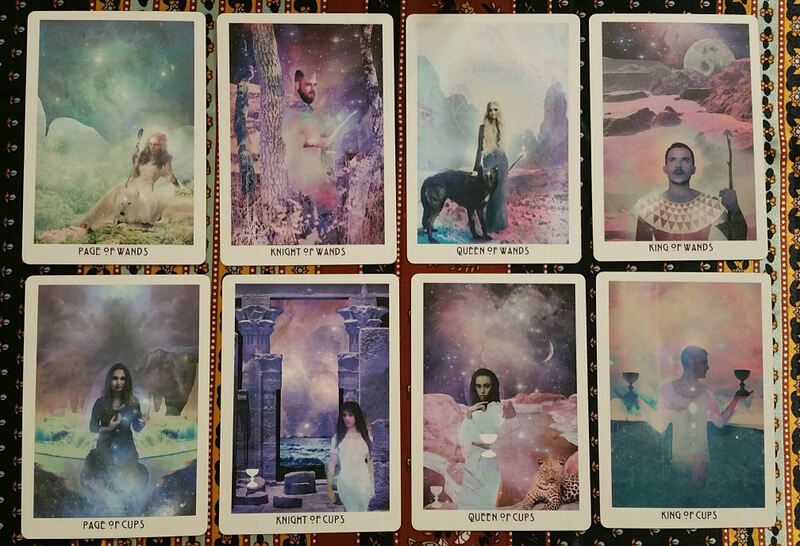 We have a softer and more ethereal Empress now in the Akashic Edition. Also, where we had a white horse for The Chariot before we now have a unicorn. I think I prefer the original Lovers card over this new one. The Transformation card here, or the Death card equivalent, is much more visually energetic than the original version, though interestingly, both utilize three point perspective. Speaking of perspective, this new Hanged Man (“Perspective”) deviates from traditional iconography, whereas the old one kept with the traditional Hanged Man symbolism. If you’re a fan of Danielle Noel’s art, then it’s worth getting both editions. In terms of how they read for tarot divination, they’re both similar. 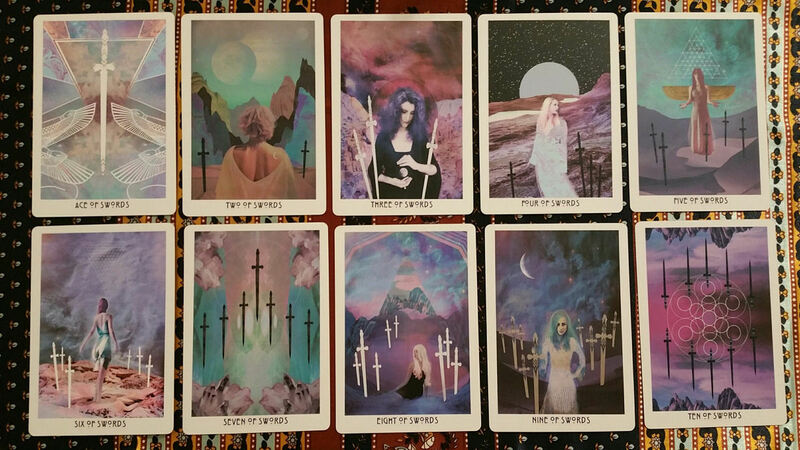 Noel’s artistic style is distinct, and I haven’t seen any other tarot decks out there on the market right now come close to mirroring her style. So for that reason alone, at least one of her decks is worth adding to a tarot deck collection. 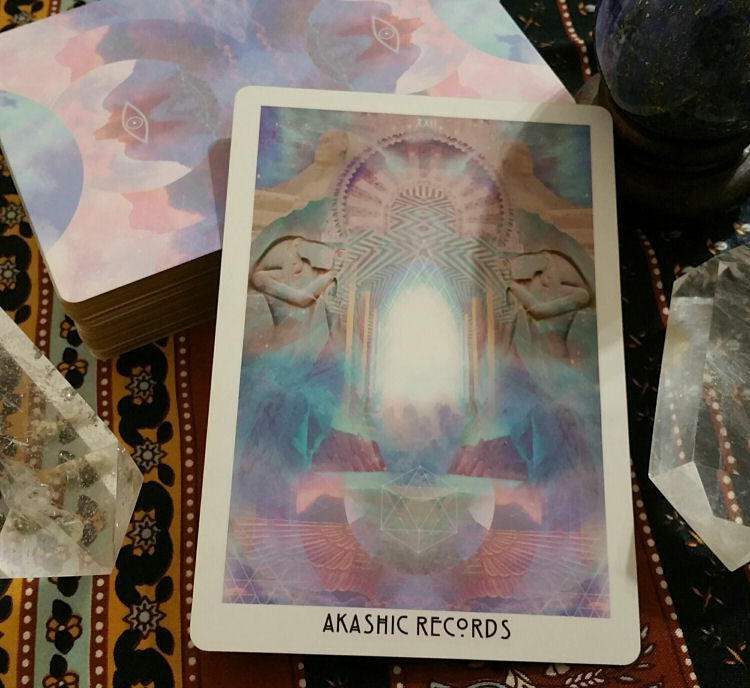 Here’s one clear difference: the addition of an Akashic Records card. A great use for this card is as a focal point during meditation. 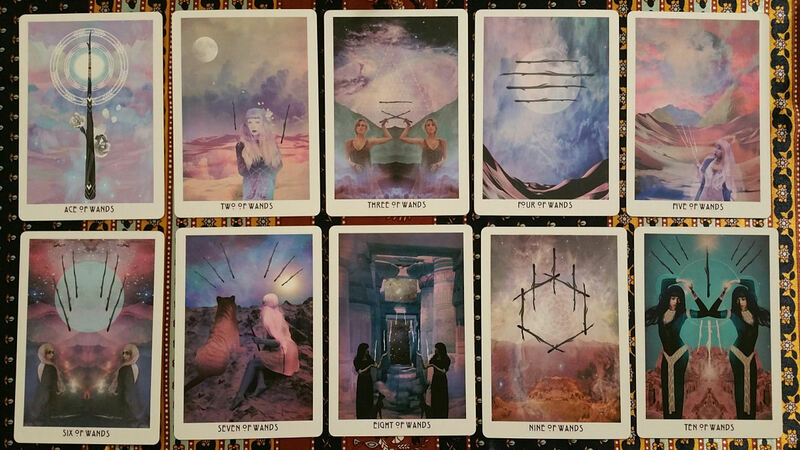 Here in the suit of Wands, five of the pip cards remain the same (with minor revisions) whereas five are completely different. Overall, the tone of the Wands here remain the same between the original edition and the Akashic. Here, seven cards from the Cups are about the same, with three new designs–Three, Eight, and Nine. As I go through these cards, I’m reminded of why I was so excited about the first Starchild. 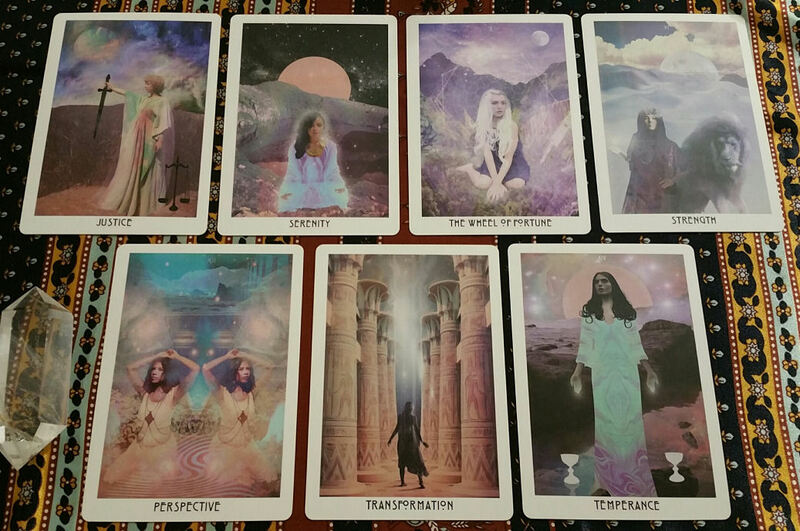 There’s this ethereal New Age mystic visions character to this tarot deck that has come to define 21st century spirituality. Here in the Akashic Edition, the new Ace of Swords is so much more powerful. I love the white outlining of the sword and the Faravahar wings. The Two of Swords changes perspective. Rather than being an onlooker, we are now seeing the choice of the two swords from the perspective of the seeker. Interestingly, the suit of Swords contains the fewest instances of full moon imagery. I do sort of miss the old Ten of Swords, however. Personally, I prefer the old suit of Swords over the new Akashic suit of Swords, because the original version was more emotional. The Akashic version takes a more cerebral and abstract interpretation of the swords, which works for the suit if you correspond it with the element Air, but I do miss the more visceral suit of Swords from the original. 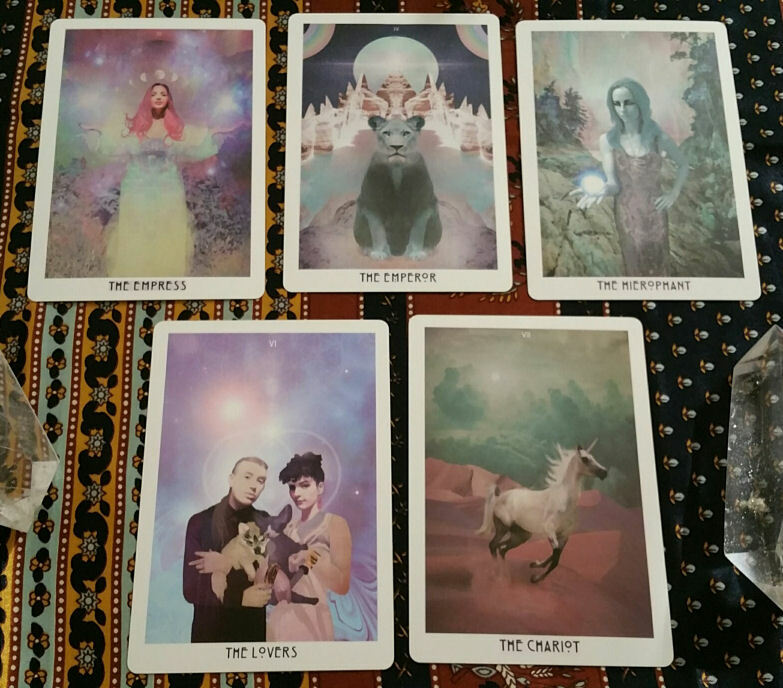 Here we see the Suit of Crystals (Pentacles or Coins equivalent) and I’m so happy that some of my favorite cards from the deck, the Five of Crystals and the Ten of Crystals, remain the same. I miss the old Two of Crystals, though, which depicted an Asian woman with glowing crystals in each hand. In the courts, we see many new faces. In my previous review of the original, I mentioned an Aquarius-Pisces vibe to this deck and I stand by that still. There is a lot of astrological Water energy coming through. One point rings consistent throughout the Akashic Starchild— Noel’s ingenuity. Also, the timing of her creative vision is incredible–there is something about it that is both timeless-spiritual and yet so 2015-2016. Something about this deck reminds me of the movement that spiritualist Marianne Williamson started, which paved the way for figures like Gabrielle Bernstein. 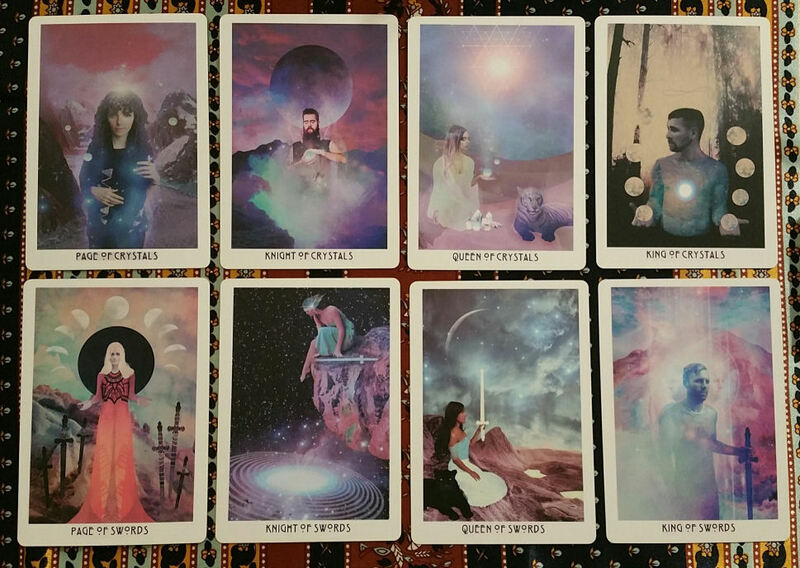 I recently read an article that referred to Bernstein as the “Dalai Lama for the Gossip Girl,” and if that’s the case, then the Starchild Tarot Akashic Edition is the Gossip Girl’s tarot deck of choice. The accessibility of Starchild means that the use of tarot cards as tools for intuition has now seeped into mainstream mindfulness. 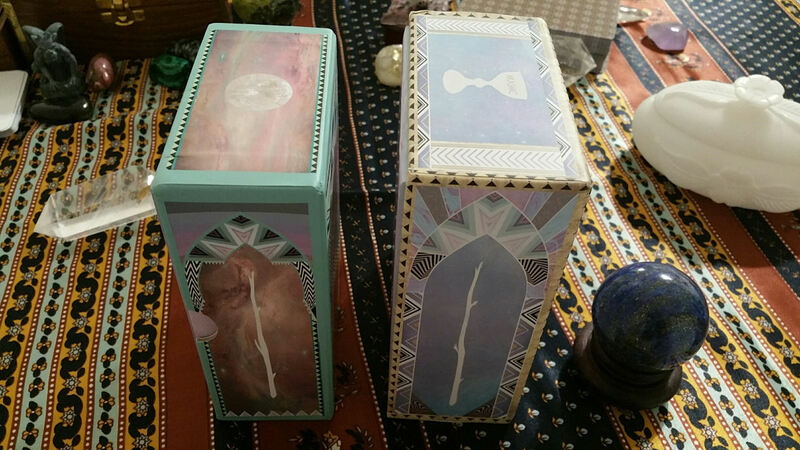 I display many tarot decks in the entertaining room of my home and whenever non-tarot friends visit and scan my decks, I find it so interesting that many of them go straight for the Starchild decks. To me, that says something about what Noel has accomplished here. 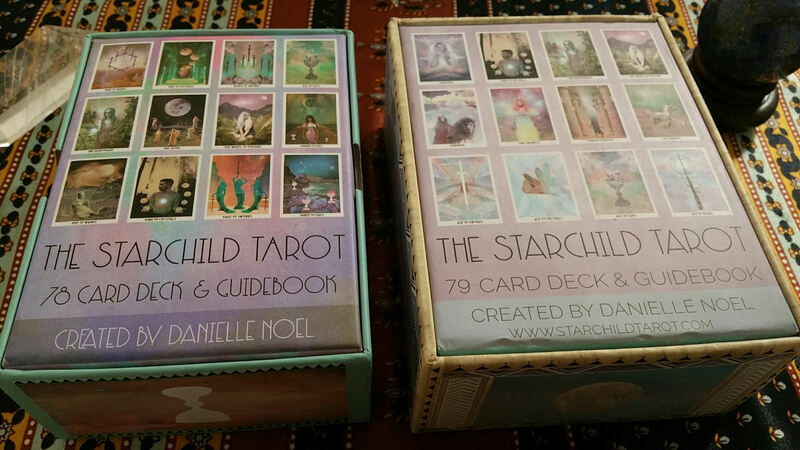 The Starchild Tarot has the ability to introduce tarot to a new 21st century audience. 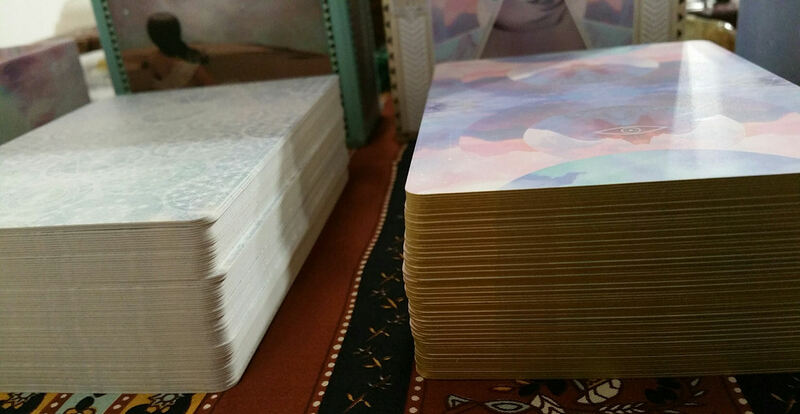 Here I’m just comparing the packaging of the two decks, side by side. Again you can see the creative decision to emphasize a more pastel palette. 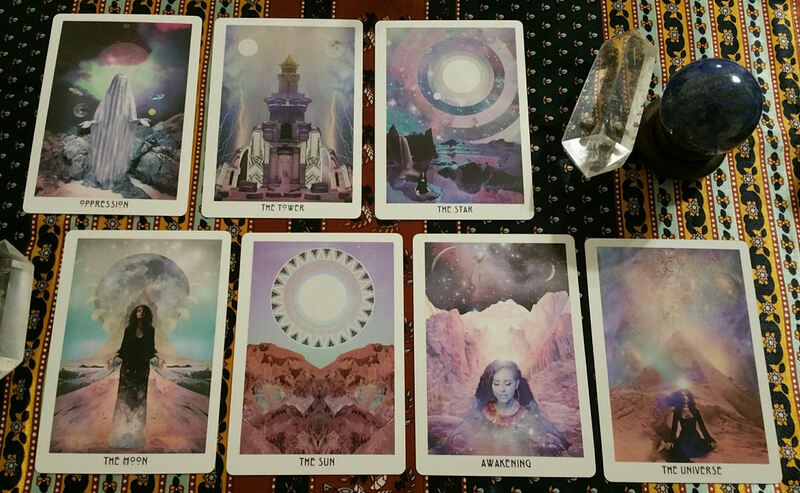 Wild Moon Tarot, someone I subscribe to on YouTube, does a wonderful side by side comparison of the two decks. Check out the video review here. 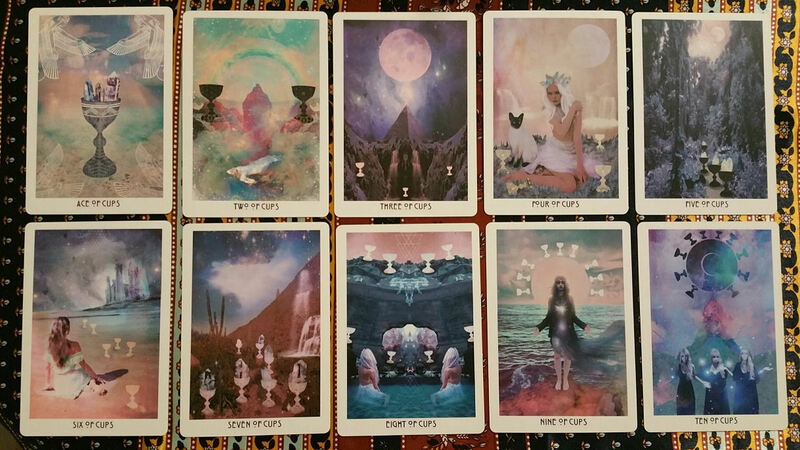 Female Millennials, especially the young cosmopolitan and urbanite white collar professional variety, seem to love, loooove this tarot deck. It’s the deck to gift to your friends who fit that profile. 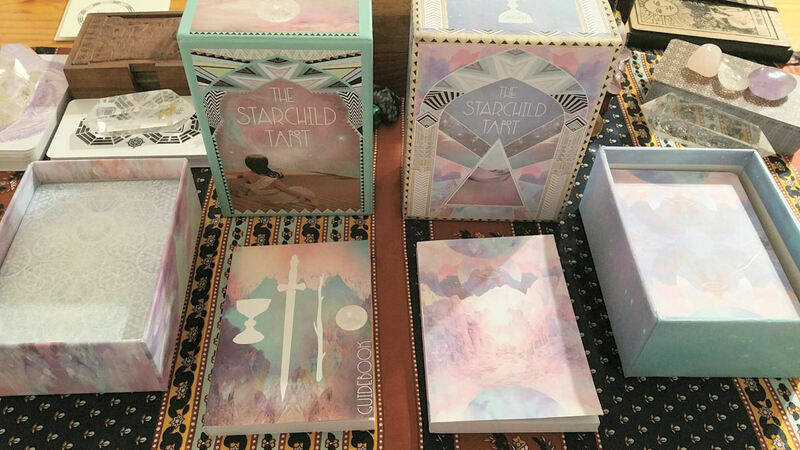 The Starchild Tarot Akashic Edition is resplendent in its photo-mosaic expression of extraterrestrial spiritual consciousness. The detailing, astute attention to technique, and Romantic-feminine aesthetic warrant high praise for this deck. I wait with bated breath to see what Danielle Noel does next. I’ve been resisting this but you always can push me over the edge if I’m teetering on the edge, I’m waiting for the borderless edition coming out!